1. Brush the steak lightly with the oil and cook in a ridged griddle pan for 2–3 minutes each side until nicely browned and cooked to your liking. Lift the steak out of the pan and set aside to rest for 5 minutes. 2. Meanwhile, in a bowl toss together the rocket leaves and the roasted vegetables. 3. Briefly warm the piada in a dry frying pan or the microwave. 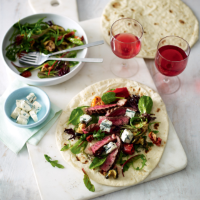 Pile the salad and vegetable mixture on to the piada, then slice the steak and arrange on top of the salad. Scatter over the blue cheese, sprinkle with freshly ground black pepper and serve. a deep-pan version, try using plain naan bread instead.